- Do you have difficulty targeting the small keys? - Do you have trouble seeing the keys? - Or do you just want to type into your device while wearing gloves? If you answer “Yes” to any of these, then SuperKeys is for you. SuperKeys is the winner of the BETT 2016 Award for Special Needs Solutions - the 'Oscars' of Educational Technology. 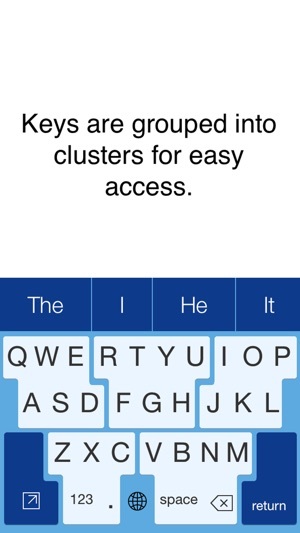 "Superkeys is the most innovative alternate access app I've seen in years. Not just for children and adults with motor disabilities but also for anyone with low vision!" The unique design of SuperKeys gives you just 7 large keys to target instead of over 30 small ones! Just tap the cluster containing the letter you want, and then tap the letter in the enlarged cluster. There’s no double-tapping, no essential swiping, and no learning required. You will rarely have to type a complete word, because SuperKeys includes the very latest version of our context-sensitive word predictor, which uses a carefully designed algorithm to minimize your key presses. The suggestions are displayed on large buttons (you can customize the size) to make selection easy, and it even updates the suggestions as a cluster is opened, making it much more likely that word you want is included. SuperKeys shows up to 36 of your keyboard shortcuts, which are fully customizable in your iPad's settings. 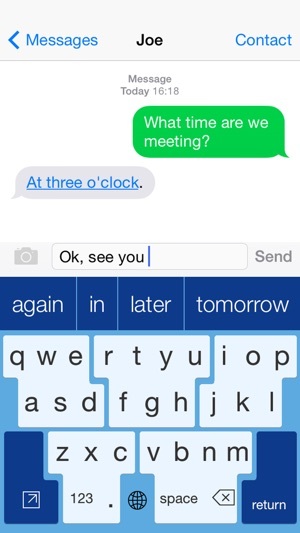 You don’t have to remember any letter combinations – just tap the shortcuts key, then tap the phrase you want. Just one tap can enter your full name or any other phrase, saving you lots of time and key presses! 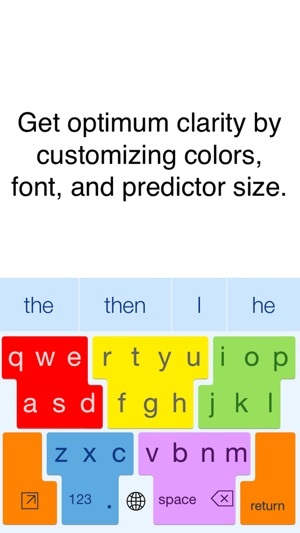 • Get optimum clarity and contrast by customizing colours and font. • Improve predictor access by setting the size that’s best for you. • Get faster access to Delete, Space and Return by setting swipe options. 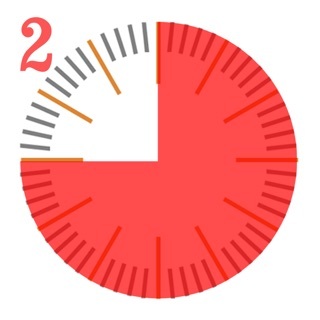 • Optimize visual experience by turning animation on or off. • Achieve full control of the Delete key with auto-repeat options. We used our 20+ years of accessible software expertise to create this unique approach to keyboard accessibility. Every aspect was meticulously researched and extensively tested to maximize the size of each key and minimize the number of taps required. The result is a keyboard that is accessible, friendly, and with a learning curve of zero. 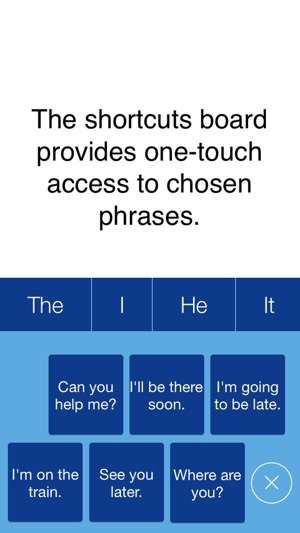 SuperKeys is optimized for both iPhone and iPad, and it includes both US and UK keyboards. 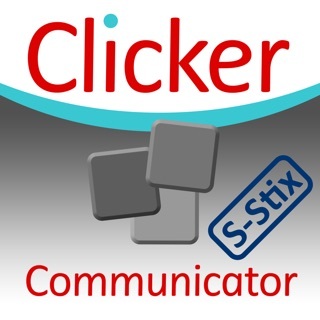 For younger writers, we also recommend our Clicker Connect and Clicker Docs apps, both of which include a child-friendly keyboard that has SuperKeys as an accessibility option. 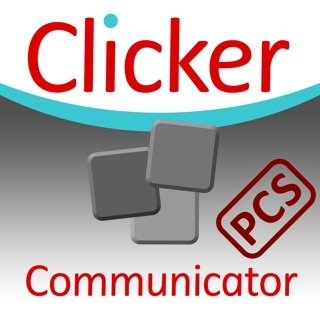 And SuperKeys is also now included in Clicker 7 for Windows and Mac. Based in the UK and US, Crick Software has a worldwide reputation for quality assistive and educational software for all ages and abilities. Find more of our apps by searching for Crick Software in the App Store . I wish that a cluster would stay open if you want 2 keys from the same place. Like to type "eat " you have to open the cluster that has e and a twice even though the letters are in the same group. Maybe they could add a double tap to keep open setting or an " open lock button next to the capital lock button. Also the color change option is nice but I wish there was a way to change individual letters. The puctation is very hard to find. A key that switches all clusters to symbols would help.